Principle #3 – Change. Learning is a specific type of change, which is governed by principles of (a) repetition, (b) time, (c) step size, (d) sequence, (e) contrast, (f) significance, and (g) feedback. 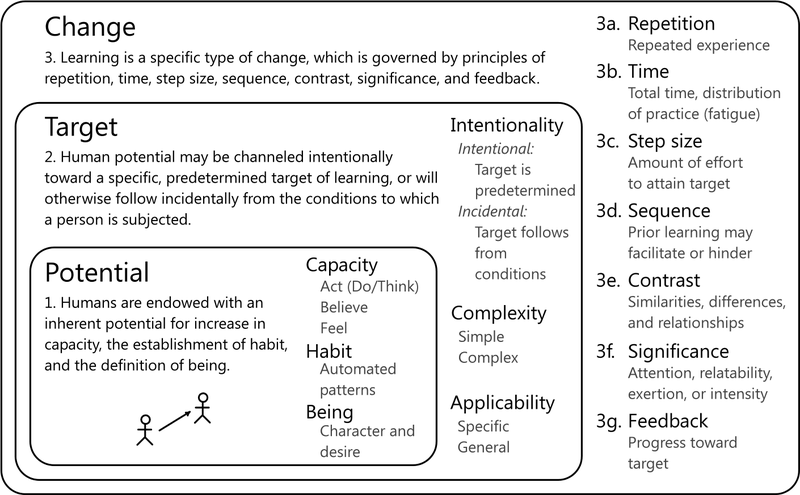 These seven principles of change are the inner mechanism by which learning is facilitated; in other words, the constraints and requirements of each of these principles must be satisfied in order for learning to take place. At first, changes in capacity and habit may be somewhat ephemeral and unstable. However, in accord with the seven principles of change which will now be discussed, these changes become long lasting and stable. There are two important aspects of time in learning. First is the total amount of time required to attain the learning target. Second is the distribution of learning activity within that span of time. Because of mental and physical fatigue, it is generally not feasible to reach a sizable target in one continuous session of practice. Instead, sufficient time must be allowed for the learning target (i.e., the pre-determined change in capacity) to be achieved, and then practice must be distributed within that span of time as necessary to allow for recovery from physical and mental fatigue. [Note: Time is primarily a function of repetition (Principle #3a), or, the duration and frequency of whatever practice models, exercise, or experience (Principle #4) are necessary to effect the desired change in capacity (Principle #2).] Distribution of practice is also necessary because massed, repeated exposure results in temporary automaticity, meaning the activity may be performed without attention. Until firmly established however, this automaticity is fleeting. Principle #3f – Significance. That which is to be learned must be significant in some way to the learner. Significant learning experiences are those which claim the attention of the learner, those which are connected to prior experience and knowledge, those which require the exertion of effort, or those which are accompanied by an intensity of sensation or emotion. Significance through meaning can result from repetition (i.e., the establishment of familiarity of a previously unfamiliar pattern, as described in Principle #3a) but may also initiate it. For example, the occasional experience which has a certain novelty, demands great effort, or is accompanied by strong intensity or emotion will often be rehearsed repeatedly in the mind, related in communication with others, and even acted out. Mental rehearsal permits learning with apparently, but not actually, less repetition than might otherwise be expected since internal rehearsal takes the place of external reenactment. [Note: With greater significance and contrast (Principle #3e), fewer acts of repetition (Principle #3a) are required since once the critical features are understood, it is no longer necessary to discover them.] Also, as previously noted, (Principle #2), significance that stems from novelty, intensity, and effort wanes with repetition, as the mind and body adjust and provide automatic, but temporary, ways of responding. Principle #3g – Feedback. Feedback is the means by which learning is directed toward a specific target of attainment. All intentional or directed learning is aimed at the attainment of some target. Feedback is the means by which the learner, or any other agent directing the learning process, ascertains whether or not progress is being made toward the end goal, and whether or not the goal has been reached. Feedback may come in many forms but, when effective, always provides an indication of (a) whether or not the target has been attained, (b) whether or not the learner is making progress toward the objective, and (c) what needs to happen in order for the learner to move forward. It is also true that feedback plays a role in incidental learning—i.e., learning in which the target is not intentional, but rather, is incidental to circumstances to which the learner is subjected. By this definition, there are two cases to consider. First is the case in which a person has no intention to learn, but engages in various activities for some other reason (e.g., to earn money, to pursue pleasure, to get a high score, to avoid negative consequences, or to get something for nothing). In this case, the feedback that person will be attending to is feedback regarding whether or not they are meeting their goals. Under these circumstances adjustments may be made that result in an increase of capacity or establishment of habit, and thus, learning will occur. As an example, many people have little interest in technology per se, but are very interested in maintaining social connections and interacting with their friends. In pursuit of new means by which to engage, they incidentally acquire knowledge about, skill to use, and habits of engaging with mobile devices and online social networks. The second case where feedback plays a role in incidental learning is when a person is actually working towards a predetermined learning target (i.e., an intentional target), but makes incidental attainment of other targets along the way which may or may not be incremental steps toward the end goal itself.